Feedlot operators likely to remain cautious when bidding on feeder cattle. Cattle sold by feedlots during January were in the black in January for the first time in several months, according to the Livestock Marketing Information Center (LMIC). Fed steer prices in January were the highest for any month since June 2016, with January’s closeout profit the largest for any month since the summer of 2014. Estimated closeouts by LMIC showed red ink in each month for the last seven months of 2016. In fact, when all economic costs were considered, only two months since January 2015 were profitable, LMIC noted. “Even though returns have improved, due to huge financial losses in recent years, cattle feeders will likely remain rather cautious when bidding for feeder cattle,” it added. Assuming a feeder steer weight of 700-800 lb., LMIC calculated the January breakeven steer sale price at an estimated $112.00-114.00/cwt. LMIC suggested that breakeven sales prices for the next several months will remain low, ranging from about $108.00 to $112.00/cwt. throughout the spring months -- the lowest since early 2011. 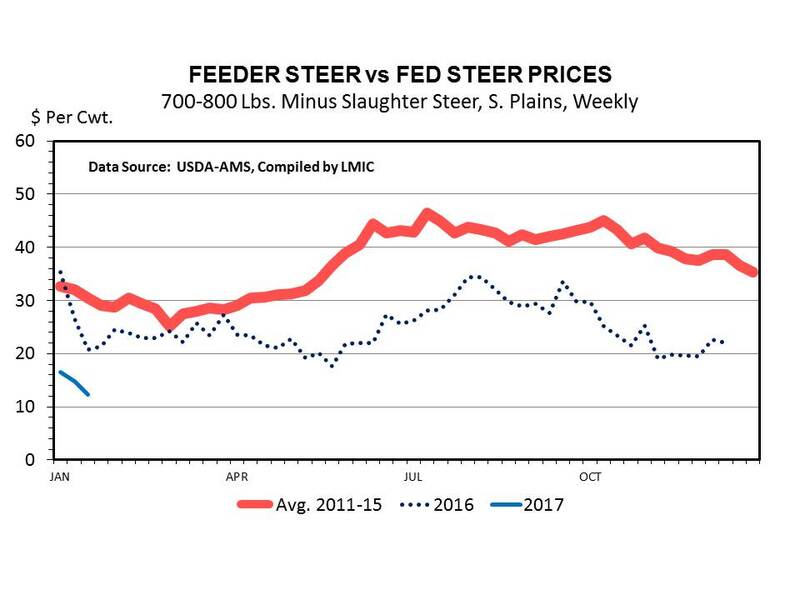 LMIC said important adjustments between the prices of feeder steers and fed animals began in the summer of 2015 as cattle feeding losses began to eliminate huge calf and yearling premiums (i.e., feeder price premiums per hundredweight relative to fed cattle prices in the same time frame were much larger than normal). In the summer of 2015, the premium for a 700-800 lb. steer, at times, exceeded $75.00/cwt. in the southern Plains. By year-end, that had dropped to just over $30.00/cwt. LMIC said the lower feeder cattle prices also reflects bigger calf crops.